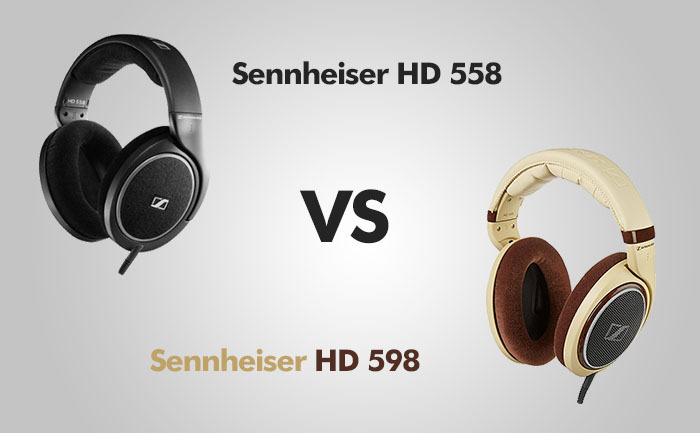 This time we will take a closer look at the two open-back headphones from Sennheiser: HD 558 and HD 598. They are very similar in many aspects, but there are also a few differences that can decide whether the particular model is better for you. Check the review to find out more. There are not many differences when it comes to the build quality. Both headphones are made of high-quality plastic. For some people, it may seem a bit cheap move from the Sennheiser, but keep in mind that will let them keep the weight low. The construction is both strong and flexible. There are no problems with durability. So even if you are not a very careful user, you probably won’t see any noticeable scratches, even after a longer use. I expect that they will last years with a proper care. If you are looking for headphones from the purely built quality perspective and not the comfort of use, you should probably look somewhere else. The earpads are made of velour. This is a great move, especially if you spend a lot of time watching movies or playing games, but if you want to use them in a dirty environment, the dust and dirt will stick to them and it’s not easy to clean it off. They are also not good for exercising because they soak sweat like a sponge. The good thing is that the pads are replaceable. You can buy rubber pads or the new velour ones if they are used off. But this shouldn’t be an issue during a normal use. When it comes to color schemes, 558 comes only in black and 598 comes in black and ivory. They are very comfortable. Often, you will often forget that you are wearing them. The velour plush padding makes both models very comfortable to use over long periods of time, even 8+ hours gaming sessions, and because they are over-ear headsets they don’t press your ears. Glasses won’t be a problem either. I wear thick-framed glasses to look at the computer screen. As some headphones may press them too hard, I wear these headphones with no issues at all. Both models may get a little hot, only when the room temperature is high, but it’s common for all over-ear headphones. The cord is detachable in both models, making it easier to store and transport without damaging the headphones. You can also get a new cord if something goes wrong with the current one. If you buy HD 598 you will receive an additional, shorter 1.2 m, 3.5 mm cord. So if you don’t need a 3 m cable when you work at your desk or use a portable player, this can be a good option for you. The thing that I don’t like is that there is no volume control, but it can be justified because they are primarily (but not necessarily) designed to be used with an amp, so it probably won’t be a problem for most users. The bigger problem can be with a 6.3 mm headphone jack and not the most popular 3.5 mm that almost every portable device is equipped with. 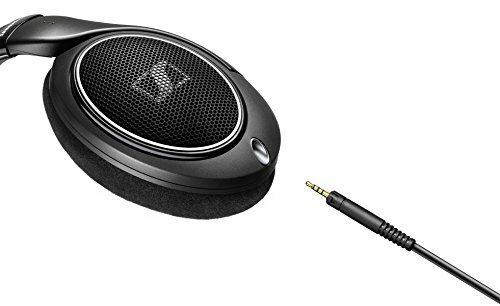 Although Sennheiser includes a 6.3 mm to 3.5 mm adapter, it sticks out a bit, so if you don’t have a lot of space there, you won’t be happy. Now, we get to the most important part – sound. If you read a part about a build quality and comfort of use, you probably noticed that there weren’t many differences between these two models. It starts to change a bit when it comes to sound quality. Don’t get me wrong, they both sound great, but they also sound different, therefore the target market is not the same. First, let’s talk about similarities. They are both open headphones. That means that they are intended to be used at home to listen to music, playing games or watching movies. They are not intended to be used in a library unless you want to share your music taste with everybody else. They are not good when it comes to isolating sound from the outside – just use them in quiet places. If you haven’t used quality headphones before, you will hear parts of music that you’ve never heard before. They will bring out every element of a song, lyric, and instruments that you have been missing out all these years. They will bring a new life to your music collection and you will enjoy your best songs you’ve listened to hundreds of times with the whole new experience. They sound really great at high volumes. I’ve never had a pair of headphones that sounded this good this loud. They will also be great for FPS players. When you put them on you will be playing your games with the audio you missed before. Before comparing two sets of headphones you should remember that they begin to shine after a proper burn time – about 40 hours. After that time you should start comparing them. The biggest difference between the two is sound quality. The 558 have a bit punchier bass and 598 are more treble friendly. The 558 are pretty good for movies, but the 598 will satisfy music lovers more, being able to clearly hear the vocals and individual instruments like you were in a concert hall. If you listen to a lot of instruments where the high tones are important, 598 is for you. Buy them if you prefer a balanced tonality, with neutral lows and mids, and great highs, especially if you listen to classic rock, classical, country, jazz or folk. Everybody who wants a 3 dimensional sound with a good soundstage should invest in 598. Some people say that the 558 sounds the same as 598 if you remove the pads inside the ear cups, but other users say that this doesn’t work, 558 sounds muddy and isn’t as clear as 598. 598 has a great soundstage, you can hear single instruments from the exact direction they are intended to be heard. If you want a great soundstage and clarity get the 598 model. I’ll encourage you to buy an amp to get the best sound out of these headphones. They will sound fine on the regular computer input, but you will get most out of them when you use an amplifier. PROS: Light / Good bass / Comfortable airy pads / Long cord / Removable cord. PROS: Light / Good treble / Comfortable airy pads / Two cords included / Great sound stage / removable cord. CONS: Leaks sound / Weaker treble than 598 / Have to use 6.3 mm to 3.5 mm adapter / Only one cord / No volume control on the headphones / No cable with 3.5 jack / Plastic construction. CONS: Leaks sound / Have to use 6.3 mm to 3.5 mm adapter / No volume control on the headphones / No cable with 3.5 jack / Plastic construction. Buy one of these headphones if you intend to use them in an environment where there isn’t much background noise and you don’t care if the sound is leaking outside. Buy 558 if the bass is more important than highs and you want the best quality for the buck. They are not as good as 598, but maybe there is no need for you to overpay. It’s hard to find a better pair of headphones for around 100$. It’s a great pair of headphones that will put a lot of more expensive models to shame. Buy them if you like to play games and watch movies. The 598, on the other hand, is great for music lovers and audiophiles, when you really want to feel each instrument and know where the sound is coming from. This model comes not only in black but also in ivory color. The frequency is wider and the highs crispier. Buy them if you play games, watch movies and listen to music.